KARACHI: The export of kinnow is going to start from December 1 and it is expected to fetch about $200 million for Pakistan this year. The production of kinnow is likely to fall 15% this season, but it will be largely offset by an improvement in fruit quality. A quantity of 350,000 tons is estimated to be exported in the season. 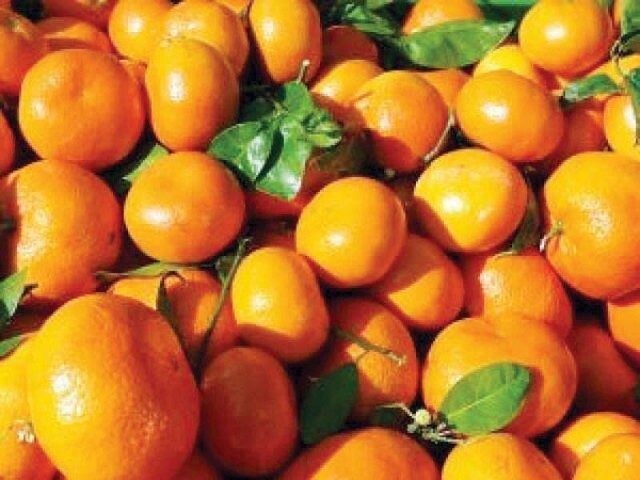 “The quality of kinnow is projected to be better this year due to efforts made by the fruit association and Ministry of National Food Security and Research, thus the likely decline in production may not affect the targeted revenue,” Pakistan Fruit and Vegetable Exporters, Importers and Merchant Association (PFVA) Patron-in-Chief Waheed Ahmed said. According to a press release, he said the revenue through the export of citrus fruits could easily be enhanced to $1 billion provided the government implemented the proposals shared by the association. The Citrus Development Board, established by the government, was part of the proposals made by the association for the improvement in production and exports. Ahmed said Pakistan’s exporters would be facing stiff competition from kinnow exporters of Turkey and Morocco, where the production cost and price of the fruit was lower, posing a challenge for Islamabad in various traditional markets like the Philippines, Sri Lanka, Bangladesh, Canada, the UK and Middle Eastern states. “We are trying our best to not only protect existing traditional markets, but also explore new destinations for the fruit,” he said, adding the approval of various facilitation centres and export firms by Chinese quarantine experts was part of the drive initiated by the association to tap new markets. China could be a lucrative market for Pakistani kinnow keeping in view the expected cut in cost of exports under the China-Pakistan Economic Corridor (CPEC) project. “The PFVA will try to start exports to China this year,” he said. A challenge for the exporters is to tap the world’s largest market in Russia where higher duties are imposed on Pakistani kinnows due to application of additional valuation. Under the present valuation mechanism, Pakistan may hardly compete with other countries paying comparatively lower duty in Russia. “The association and ministries of finance and commerce are trying to resolve the issue at the diplomatic level,” Ahmed said. Unfortunately, he said, Iran’s reluctance to issue import permits had prevented Pakistan from making inroads into a huge market of over 80,000 tons next door. Published in The Express Tribune, November 30th, 2016.